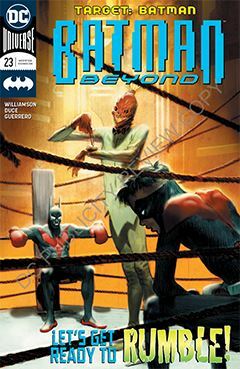 Batman Beyond vs. Scarecrow Beyond – a reinvention of the classic Batman villain who used chemical gasses to instill fear in his victims. But there are no traces of gasses from the new version, so the question is: How is she doing it? I have a theory consistent with the high tech world of Batman Beyond, and that’s all I’m going to say about that. Instead, allow me to comment on the new Robin. Remember back in the 1980s when DC had its 1-800-Kill-Robin promotion? It’s not likely to be repeated, but I wouldn’t mind if they did. A comment is made about youthful enthusiasm, but with the new Robin, it’s more annoying than charming. But I honestly don’t know what the solution would be. One of the things I enjoyed about this current story was the return of Jack Ryder in the future DCU. Not all DC characters are suited to be included in the world of Batman Beyond, but Ryder fits the bill nicely. Kudos to Dan Jurgens for a judicious selection. However, as much as I enjoy Dan Jurgens’ writing, I fear he is writing comics the way they used to be written, perhaps applying out-dated sensibilities. Maybe he needs to clip Robin’s wings, and see how that works within the team dynamic.